During the long winter months, the vast majority of us dream about going across the surface of the water once again in search of adventures that provide moments of silence and joy. Here is my list of the top 10 things you should have on your fishing boat by the time the ice breaks up. Bathymetric survey: Before even thinking about going offshore, the enthusiast must consult the latest available edition of the BlueChart G3 electronic bathymetric chart that includes Garmin and Navionics content or the paper version of the body of water he wishes to exploit. 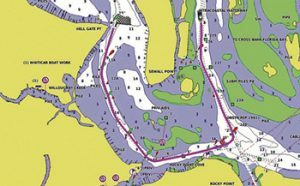 They will allow you to identify the navigation channels, the dangerous places to avoid and the potentially productive fishing areas. For example, if you have a sonar with the Quickdraw Contour function, you can create your own geo-referenced maps or modify them by adding data taken with this function. 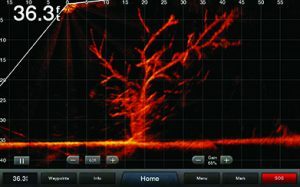 Sonar: If you go fishing without a high-performance depth sounder, it’s a bit like looking for a needle in a haystack. Manufacturers have developed all kinds of high-performance technologies. Just think of high-speed CHIRP probes, ClearVü and SideVü scanners. 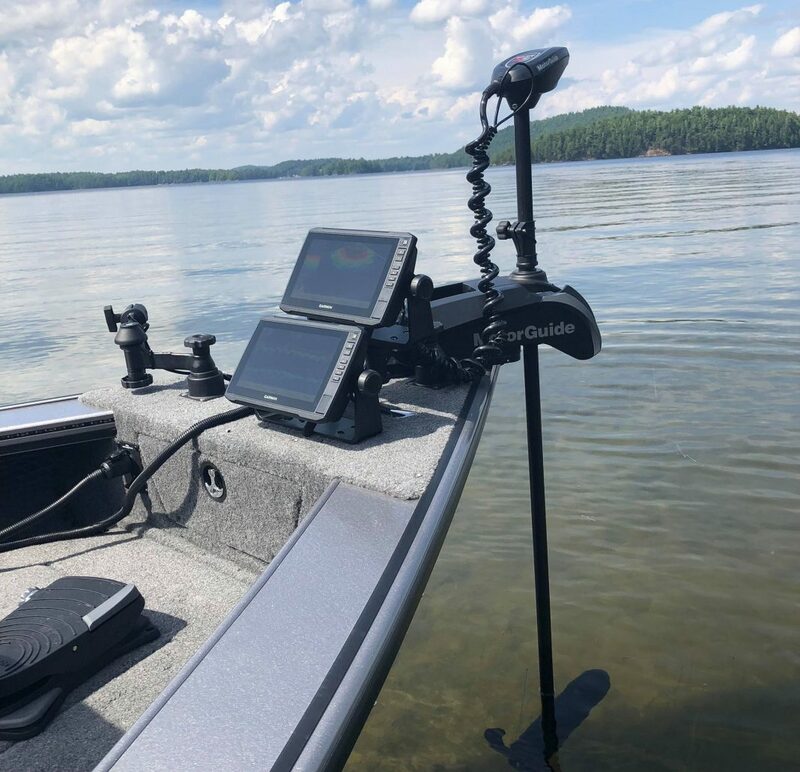 A few years ago, we saw the incredible Panoptix that offers highly detailed real-time images that are easy to interpret structures, as well as baits and fish that swim under and around your boat. The new version of Panoptix LiveScope is certainly the most amazing sonar technology of all time and it will put it all in full view for you. 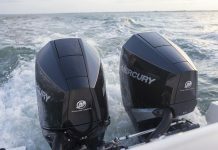 GPS – The locator: Whether paired with your sonar or not, the GPS will allow you to find or relocate the best fishing sites. You will even be able to share your spots with your friends by simply transmitting the coordinates. Electric Trolling motor: If you have not educated yourself about this type of device for a long time you will have some nice surprises. Imagine, a frontal model like the Xi5 from Motor Guide as an example that offers a very impressive GPS-guided anchoring system. It is even possible to record eight spots and eight different routes and put them in memory and ask the Xi5 to make us go over the same places. There is also a button called Jog that allows the user to move a few meters from its anchoring position to explore the surroundings and much more. Downrigger: To target the fish that are suspended in the water column somewhere between the bottom and your boat, insert your fishing line onto a line release that is attached to a steel cable which is connected to a lead ball. The fish finder shows you where the fish are located and the downrigger counter allows you to lower your lure to the desired depth. 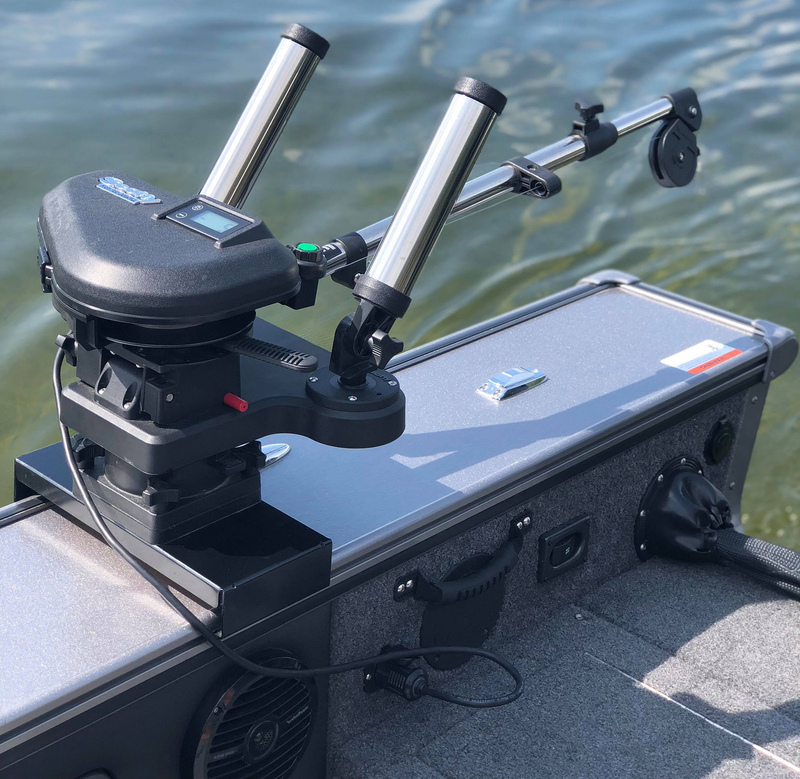 The Scotty 2116 High Performance Electric ProPack with a long telescopic boom is equipped with heavy duty, adjustable dual rod holders and many other great features. Power-Pole: I see more and more bass boats equipped with a Power-Pole. These large articulating shafts sink a spike into the bottom structure and allow the angler to position their boat during which time they can tease the targeted fish. Driven by hydraulic pressure, they can keep vessels up to 2,040 kg in position even in heavy winds and currents. This tool is ideal for people who are primarily chasing bass or pike in shallow waters. Shock Absorbing Seats: When there are many waves, you and your passengers endure impacts from the choppy water. 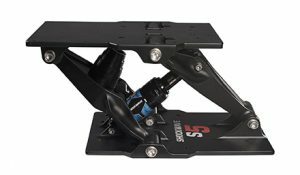 Shockwave Seats has developed the Shockwave S5 marine suspension module equipped with an air-sprung shock that absorbs the shock of a wave’s impact. The Shockwave S5 is designed to fit with virtually any seat and is easy to install. 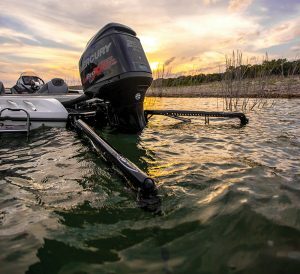 The S5 and Shockwave’s Corbin2 model seat are really great products to enhance the moments you spend on the water. Planer Boards: It presents your offering perpendicular to the boat at approximately a 45 degree angle. This is a great way to fish near the shore where it would be dangerous to navigate. There are also several species of salmonoids that do not like swimming in the same path as your outboard motor. Then you can really target and catch these fish. Full view: Underwater cameras have been providing incredible services to fishermen for several decades now. They allow you to instantly see, in image, as on television, what is under your boat or through the ice. Then you can really observe what happens under the water. Propeller: One of the greatest factors having the most influence on your performance is unquestionably the choice of the propeller. At full capacity, with proper adjustment of the trim, your engine should turn to almost 6,000 rpm. 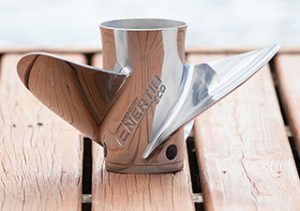 Remember that a stainless steel propeller will not bend or deform like an aluminum one. You will have better control, you can still tip over the engine to reduce friction of the boat. With the right tool like a Enertia Eco, you will gain a few more kilometers per hour without fail. Good fishing and happy shopping. Previous articleA Tropical Cruise with a twist around the Toronto Islands.